Smart-Growth Challenge: How can a successful street be transformed to meet modern design standards while preserving its essential assets? Washington Street is Hoboken’s “Main Street,” its highly successful center of commercial and nightlife activity. The stores, bars and restaurants along its 1.3-mile stretch are all within walking distance of residential neighborhoods and public transit. 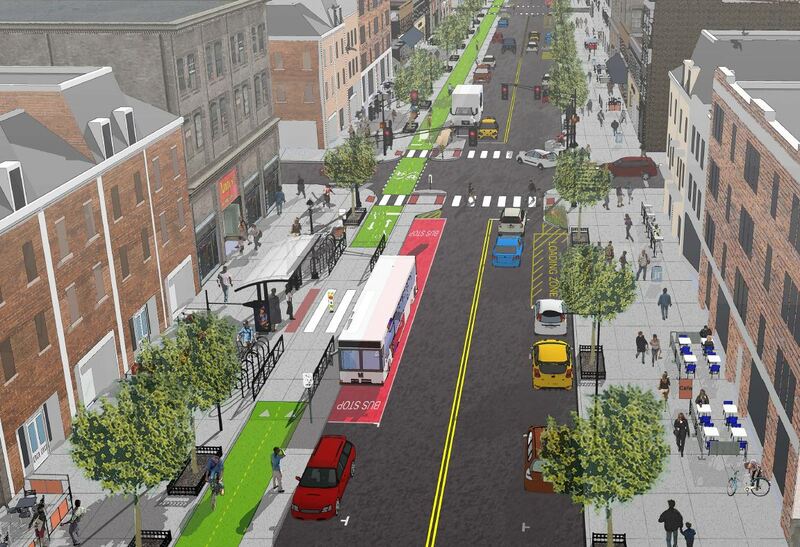 And yet Washington Street in its current condition is at odds with Hoboken’s community-wide vision for Complete Streets as articulated in its 2010 resolution . Its design allows automobile traffic and parking to dominate over other street activity; it does not conform to current standards for safety, accessibility, and multi-modal travel; its surface and sidewalks are in substantial disrepair; only 25 percent of its trees are healthy; its storm drains direct runoff directly into the city’s combined-sewer system; and its lighting is insufficient and outdated. The city embarked on an extensive community outreach program, including open-house meetings, exhibits, surveys and web-based communications, to identify a set of “Smart, Green and Complete” goals for Washington Street, including applying Complete-Streets design standards, preserving historical character and pedestrian activity, adding green infrastructure elements to reduce stormwater runoff, integrating technologies that reduce costs and enhance user experiences, and connect with other existing or planned transportation enhancements in the city. Adding digital technologies to assist in finding available parking spots, make efficient energy choices, monitor air and noise pollution and link with the city’s 311 constituent-request system. Additional initiatives include smart parking sensors, traffic counters and intelligent signals. 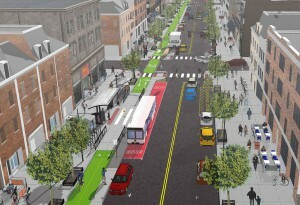 The result is a plan for a street that enhances mobility, increases walkability and connectivity, makes sustainable transportation options more comfortable and attractive, improves resiliency and boosts environmental quality, all the while maintaining the area’s distinctive historical character.